Axcel Gases is a renowned Carbon dioxide gas manufacturer and supplier, both in liquid and compressed gas forms. Carbon dioxide (CO2) is a slightly toxic, odorless, colorless gas with a slightly pungent and acidic taste. In air, Concentrations of carbon dioxide is about 0.038% by volume. Carbon dioxide gas is commercially produced by fermentation of Sugar compounds in beer, bread and liquor making industry as it’s by product. Other way of its production is by combustion of carbohydrates, natural gases and fossil fuel like wood and coal. The CO2 produced is liquid in nature. This liquid CO2 is being stored in carbon dioxide gas cylinders for any further industrial/lab grade applications. 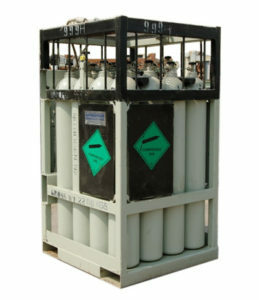 For some applications where continuous and high quantity of CO2 gas is required to be feed, We make use of CO2 gas cylinder quad which is nothing but number of cylinder interconnected and having common outlet. CO2 has got a sublimation temperature of -78.5°C (-109.2°F). Sublimation temperature is the temperature at which a solid form of a substance directly converts in to gaseous form of the substance without going into the intermediate liquid form. The solid state of the CO2 is called Dry Ice. Carbon di Oxide gas, liquid and solid ( Dry Ice ) are available in different purity grades and concentrations to meet the specific requirement of diverse industries. We have in house laboratory equipments to check the level of purity as well as various impurities present in it. 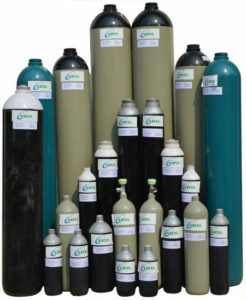 Please click here to know the different sizes of cylinders / dewars/ liquid containers available. As a main ingredient of Urea Industry. As a main ingredient in Soda based or carbonated drinks, giving it required fizz and sparkle. As a shielding gas to shield Oxygen reactive materials from the air during MIG welding process. As a mosquito repellent in advance mosquito repellent machines. As an agent for extracting more oil in oil extraction industry. As a PH level controller to enhance productivity or say efficiency in Pulp Industry. Liquid Carbon dioxide is used extensively in fire extinguishers to stop on-going fire. Dry Ice is used extensively to store perishable items by providing it a controlled low temperature. These are some of the common uses of Carbon dioxide. There are various other ways in which it can be used in a particular industry or process.